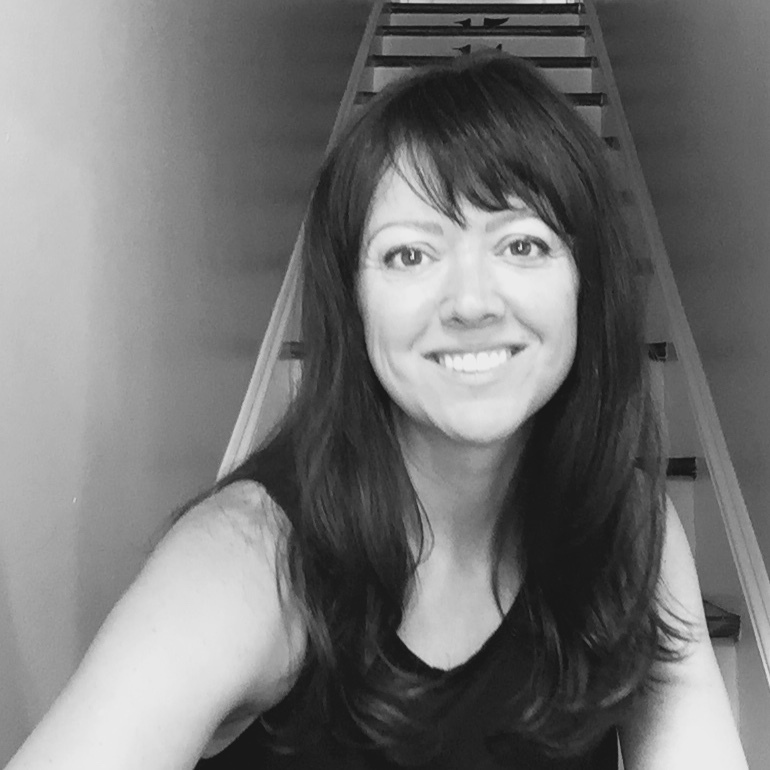 We "finished" the dining room makeover a little while back and it's high time I showed you some pictures and told you about the process. Like the rest of the house, the dining room was yellow when we first moved in. The picture on the left is of our tour with the monkeygirls in January 2013, before we moved in. The furniture pictured belongs to the family that sold us the house. On the right, you can see our furniture and the random unpackings that landed on the table. 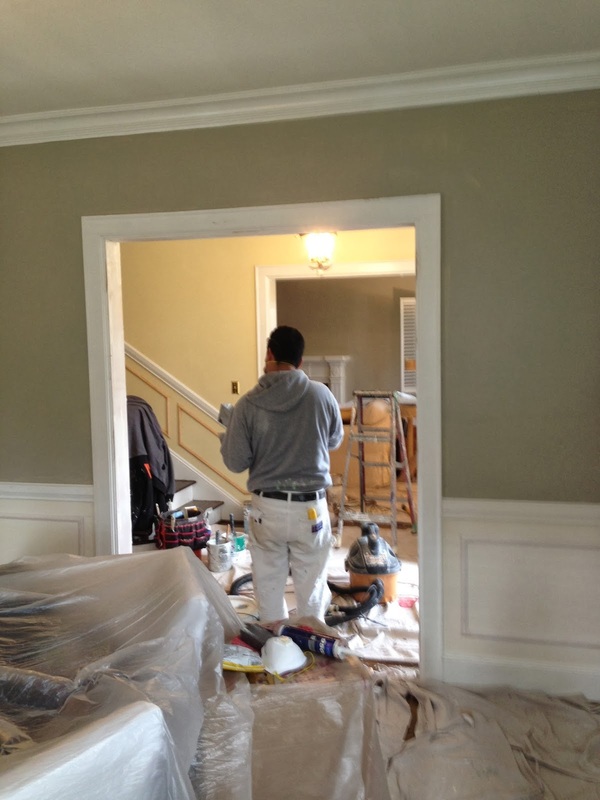 If you look closely, you can see our old dining room rug (all warm, earth tones--totally "wrong" for this house). By the time this picture was taken, I had found some inexpensive and washing-machine-safe chair covers in bright white to cover the moss green high-backed chairs we already owned. 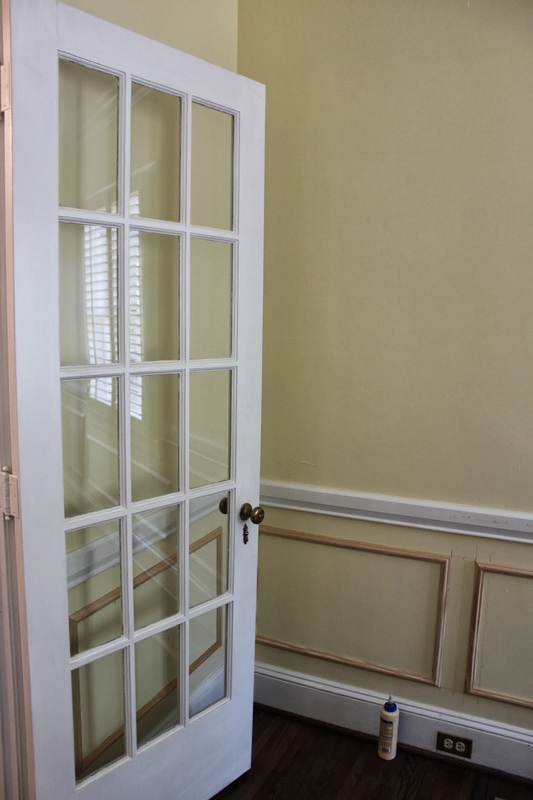 To open the room and simplify furniture placement, we choose to remove the french doors separating the dining room from the front entryway. From the entryway, the living room opens directly across from the dining room. Removing the doors made this feel more "balanced" and again, gave more of an "open" impression when you first step into the house. We also added the picture frame moulding. The next step was to patch (where the hinges had been) and paint. It's difficult to see but the small hutch in the corner is a beautiful old piece that belonged to my husband's grandmother. Inside are several small figurines and keepsakes that came to us from his family. 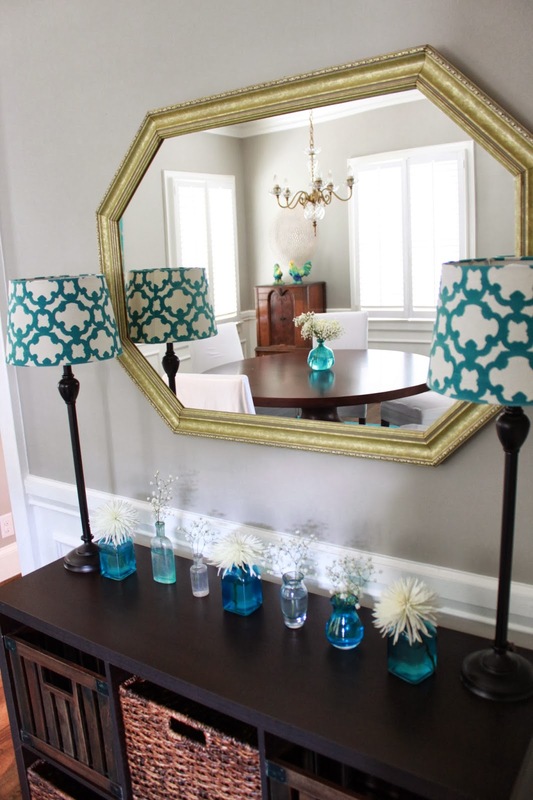 I love that you can see a peek of our ombre green staircase in the bargain-priced group of mirrors I found at Target. 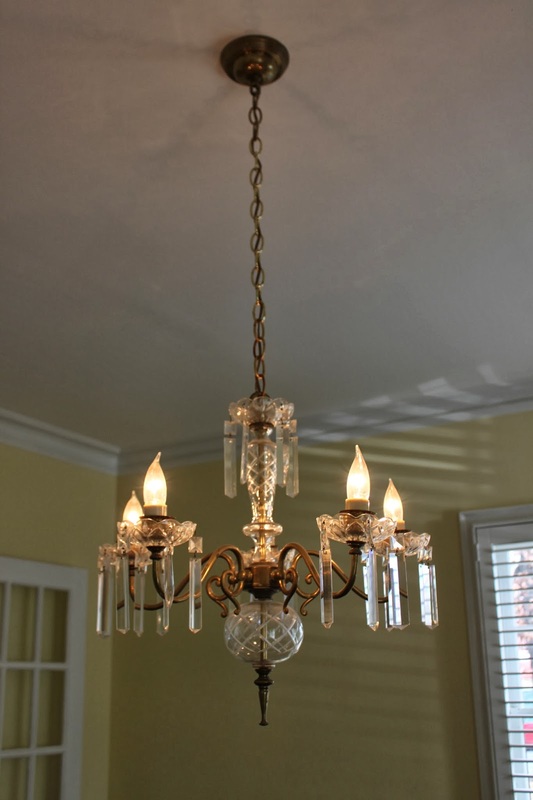 The chandelier was much improved by removing the mismatched crystal ornaments and giving it a thorough cleaning. I love the blue rug. I wasn't sure what color I wanted to use in this room until I found the rug. Once that was selected, the rest came together really easily from things we already had. The old radio cabinet was my great-grandmother's. I remember it from her dining room in all the years she lived in the same small house on Willow Road in Menlo Park, California. She used to keep family snapshots and everyone's school pictures inside. I'm so honored to hold onto it for our family. 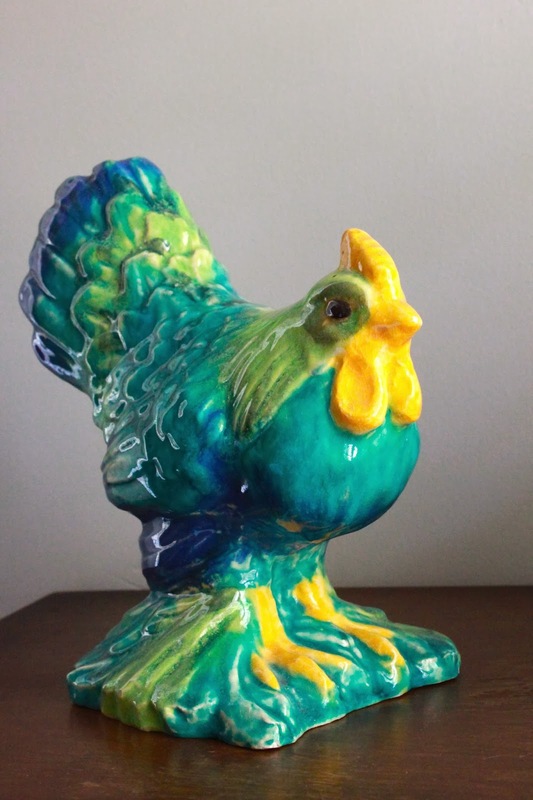 The rooster statues were my grandmother's. 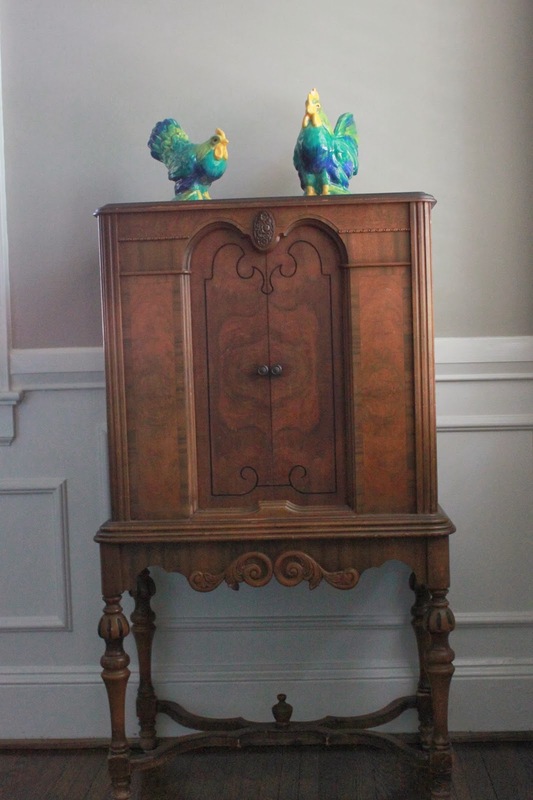 They always stood side-by-side atop my grandmother's china hutch and later, on the bookshelves in her family room. The basket shelving is great for linens, candles, napkin rings, etcetera. I love the way our random collection of small blue glass bottles and vases display an assortment of clippings and flower buds. It doesn't matter what I put in these little vessels--it always turns out great. My favorite feature in the room is the set of over-sized cutlery that hangs on the wall. This spoon and fork pair were a fixture in my grandparent's house (the house I grew up in). More than anything else I own, they evoke a deep sense of family. So this is our fun and fresh dining room. You should know, we've enjoyed a grand total of 2 meals at this table since we moved in. I love it. Everything about it. So happy the little birds match the decor so well! The color is Benjamin Moore "Revere Pewter."